..and now for the vehicle contest. Our favourite protocol droid finds that his etiquette and language skills are usefull when helping out delivering gifts to the planets farthest from the bright center to the universe. Any thoughts or comments before I make the final pics and submits? Superb... That's all I can say. Reindeer are amazing, front of the speeder / sledge is perfect, and the SW inspired gifts are sweet. There is just so much to see. I love the Darth Vader doll especially! You know, I might as well not even enter now, there's no chance for any kind of victory. Marvelous job here, I love almost everything about it; the Gungan reindeer, the unique design for the Christmas tree, the Vader teddy, the creative use for the rahkshi backs, all of this just oozes with awsomeness. I'd say you have this contest in the bag. As always, excellent work here. Now that's classy. Tips for you even though it's already pretty fantastic: Make the harnesses all one color, try and figure out a red nose for the lead Jardeer, and ...well, that's all I can think of. It's great. I'd love a separate shot with all your toys around the tree. The use of those Bionicle pieces at the front of the speeder is great, I've been looking for a use of those parts for a while. Awesome work overall. This is probably my favorite of the lot, though. *sneak preview* The next contest will be Kyle-powered ships. Ha! I like this one a lot especially the Gungan reindeer. I also like the toys in the bag like the Y-wing and the Vader doll. That is one awesome sleigh! Wow, this is amazing! I love the use of the Han Solo carbonite block, Indy Whip and hat, and Vader helmet as the presents. color me impressed! those toys are spectacular!.....and i love the tree! The overall design is really nice, the christmas tree looks very good and the detailed gifts are just fantastic. Wrapped mouse droid and a Vader doll? Pure win. 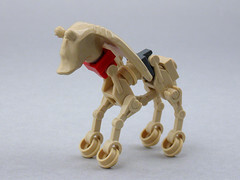 In addition, I think that the reindeer-gungans are the coolest and cutest LEGO creatures I've seen in a long time. Marvellous job, mate. Jag tror jag har hittat den skapelse som jag ska r�sta p�..
Awsome The Gungan reigndeer things are just funny. Erm, what colour is "impressed"? Is it a sort of ochre/beigey colour? But yes, I agree avec tu. Larry Lars is going to sweep BOTH content categories at this rate! 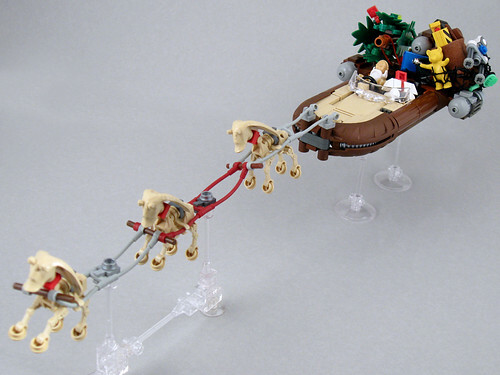 This Christmasified MOC was really fun to put together. It all started with me building the Y-wing toy and trying the beard on different figs for comic effect. Ideas for how to build a decent landspeeder had been bouncing around in my brains for a long time so that vehicle seemed to be a good choice for this contest. The design of the droid parts Jar-Jar reindeer was inspired by the robotic Reindeers from Nightmare before Christmas. I'm really glad that so many of you liked this MOC. Thanks a lot! Simply amazing. I really don't have anything else to say. As usual, always a pleasure to view your work. That's just incredible! So many great details, this should win by a mile or there is no justice! I really appreciate all the support and want to say thanks for votes. 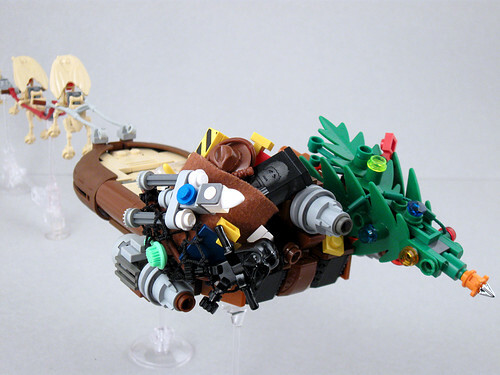 When I built the landspeeder I payed a lot of attention to details that then were obscured by the presents. Here are a couple of pics of the landspeeder as is. Click the thumbnails to have a closer look and to watch more pics at my Flickr page. That's one awesome landspeeder! I love the gearstick, and the front is rather ingenious, what pieces are they? They're the back peices for the old Bionicle Rahkshi figures. Fantastic job here, LarryLars! As always, it's a great pleasure to see your work.